Peripheral neuropathy is a term used to describe damage to nerves of the peripheral nervous system which leads to symptoms such as pain, numbness, tingling, burning, and weakness most commonly affecting the hands and feet. Peripheral neuropathy can be caused by a variety of precipitating factors including trauma, infection, diabetes, alcohol abuse, and cancer chemotherapy. If you or a loved one has been diagnosed with peripheral neuropathy, it's critical to learn everything you possibly can about this condition so that you can make informed decisions about your treatment. That's why we created the Medifocus Guidebook on Peripheral Neuropathy, a comprehensive 179 page patient Guidebook that contains vital information about peripheral neuropathy that you won't find anywhere in a single source. The signs and symptoms associated with peripheral neuropathy based on the specific underlying cause, when known. Determining and treating the underlying cause of the condition, if possible. Controlling and alleviating pain and other bothersome symptoms associated with the condition. Preserving function of the affected limbs, such as the hands and/or feet. Preventing a significant decrease in the patient's quality of life. The management of peripheral neuropathy in patients where the underlying cause can be identified, such as diabetes, autoimmune disorders, infectious diseases, nerve compression, and cancer chemotherapy. The treatment options that are available for controlling pain that does not adequately respond to drug therapy, including nerve blocks with local anesthetics and spinal cord stimulation. The role of physical and occupational therapy in functional rehabilitation of patients with peripheral neuropathy. The role of complementary and alternative therapies in the management of peripheral neuropathy. Practical tips and suggestions for how to minimize the negative impact of peripheral neuropathy on your quality of life and learn how to better cope with the condition. Important questions to ask your doctor about peripheral neuropathy. A Guide to Recent Medical Literature on Peripheral Neuropathy - This section of the Guidebook contains an extensive bibliography of over 100 references to recently published articles about Peripheral Neuropathy in authoritative, peer-reviewed medical journals with links to the absracts (summaries) of the articles. These articles represent the latest advances in the field and focus on cutting-edge research, new developments, and the lessons learned from recently published clinical trials involving patients with Peripheral Neuropathy. This is the same level of that is used by doctors who treat people with Peripheral Neuropathy to keep abreast of the latest developments and breakthroughs in this specialized field of medicine. Centers of Research for Peripheral Neuropathy - We've compiled a unique directory of doctors, hospitals, medical centers, and research institutions with special interest and, in many cases, clinical expertise in managing people with Peripheral Neuropathy. The "Centers of Research" directory is a valuable resource for quickly identifying and locating leading medical authorities and medical institutions both within the United States and other countries who are considered to be at the forefront in clinical research and treatment of Peripheral Neuropathy. You'd have to spend days - or even weeks - attempting to compile your own list of doctors and medical centers but, with the "Centers of Research" directory, the information is already right at your fingertips. All you have to do is act on the information by selecting and contacting the experts or medical institutions listed in the directory by state and country. 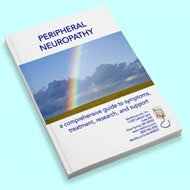 Organizations and Support Groups for Peripheral Neuropathy - The Guidebook also includes a directory of organizations and support groups whose goal is to help people with Peripheral Neuropathy by providing access to information, resources, and services. Many of these organizations can answer your specific questions, enable you to "network" with other patients, and provide guidance in areas such as financial, social, or medical-legal issues. This valuable directory of organizations and support groups includes complete contact information, including phone numbers and E-mail addresses. 20% Discount - For a limited time, you can purchase the Medifocus Guidebook on Peripheral Neuropathy at a special 20% discount off the regular list price. Your 20% discount will automatically be applied when you go to "Checkout". Order Your Copy of the Medifocus Guidebook on Peripheral Neuropathy Today! The Medifocus Guidebook on Peripheral Neuropathy is available in the following two convenient formats: Printed and Digital. "This is the BEST informational and reference book pertaining to my long-time ailment 'Peripheral Neuropathy'. I have researched this relatively obscure subject for seven years. The MediFocus Guidebook on Peripheral Neuropathy is easy reading, concise, and contains great references." "Your very informative Guidebook helped me understand my Peripheral Neuropathy much better than my doctor had time to explain. Thank you." "I recently purchased your MediFocus Guidebook on Peripheral Neuropathy and found the information quite helpful in making decisions about the direction I wanted to take in dealing with my condition. Even after meeting with a Neurologist and being tested, I had many questions that he was unable to answer. We all have to take control of our own health care and the MediFocus Guidebook is a great tool for doing that."